Motorcycles are great fun, but you need to be careful. Motorcycles have higher fatality rates (and smaller margins for error) than automobiles. You need motorcycle insurance to protect yourself should become injured or if your motorcycle damaged or stolen. You also need motorcycle insurance to cover property damage or injury to others caused by you (and/or other household members) as a result of operating a motorcycle. Motorcycle insurance protects you should any of these situations occur! CoSaint offers motorcycle insurance in South Carolina, North Carolina, Ohio and Kentucky. When it comes to motorcycle insurance, CoSaint will work with you to assure you have the right coverage at the right price. As an Independent Agency, we will get quotes from leading insurance companies to help you select the most appropriate motorcycle coverage for your situation and we will walk you through your options to help identify additional savings. You can ride your bike comfortably knowing that you have the right insurance coverage to protect you along the way. Get Motorcycle Insurance Quotes from the Leading Providers Now! 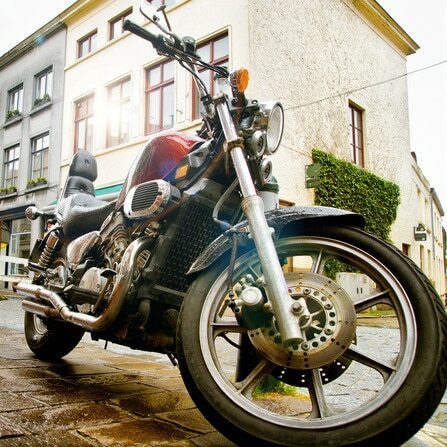 A motorcycle insurance policy can include various coverages for you, your motorcycle, and others. Listed below are a few of the main coverages that can be included on your motorcycle policy. Bodily Injury and Property Damage Coverage covers you if you are found to be at-fault for an accident that injures another person or damages someone’s property. The damages are covered up to the limits on your policy. These coverages are very similar to Bodily Injury and Property Damage on an auto insurance policy. Uninsured/Underinsured Motorist Coverage (UM/UIM) covers you if you are injured in an accident by someone who does not have insurance (or does not have enough) insurance coverage. UM/UIM will cover the injuries (and damages) in which the at-fault party is legally liable such as medical treatment and lost wages. Comprehensive and Collision Coverage pays to repair or replace your motorcycle if it is damaged or stolen. Deductibles work the same way as your auto insurance policy. You are responsible for your chosen deductible and the insurance carrier will pay for the remaining damage in the event of a claim. Just like your auto policy, your CoSaint agent will work with you to determine the appropriate coverage and deductible for your policy. Medical Payments Coverage covers the cost of necessary medical care you receive as the result of a motorcycle accident. Medical Payment coverage is often limited to medical treatment received within the first three years after an accident and is limited to a specific dollar amount (listed on your policy). In some states, Medical Payments coverage only applies after other medical / health insurance coverage is exhausted. Your CoSaint agent will help you determine the appropriate amount of Medical Payments Coverage for you. If you select custom parts coverage, you will receive coverage (up to a defined limit) for your custom parts on your motorcycle. Custom parts and equipment coverage is available at various levels, so talk to your CoSaint agent to help determine the appropriate coverage for you.